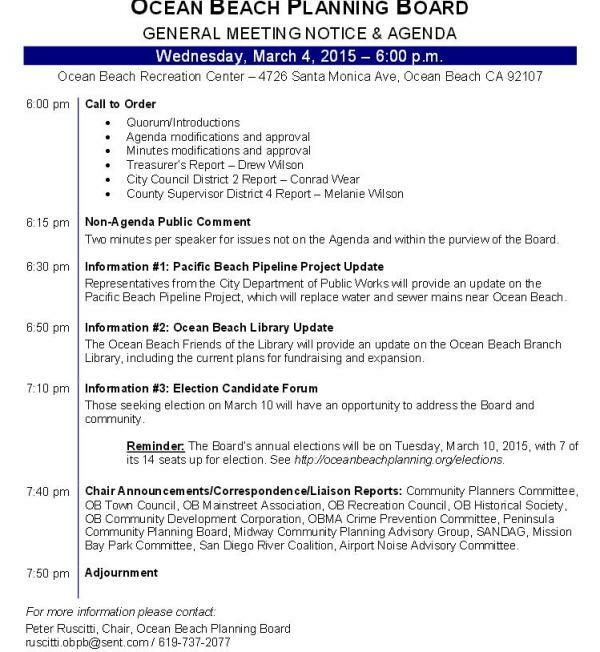 Here is the agenda for the Ocean Beach Planning Board’s March 4th monthly meeting. They meet at 6pm sharp in the OB Recreation Center, 4726 Santa Monica Avenue. The Board will receive an update on the Pacific Beach pipeline project – which will replace water and sewer main lines near OB. The Friends of the OB Library will give a presentation to the Board which will include an update on the library expansion status, and current plans for fundraising. A Candidate Forum will then be held during the meeting, where those seeking election or re-election will have an opportunity to address the community. March 10th is the date of the Planning Board annual election, which will be held from at the OB Rec Center, 3 to 7pm. The Ocean Beach Friends of the Library won’t be presenting tonight at the Planning Board Meeting. Mr Ruscitti will be amending the agenda at the meeting. Stay tuned though. We’ll be presenting at a future meeting.